NTT Solmare and Sammy Networks presents World’s First Mix of Casino Slots and Dating Simulation Game!“Win His Heart Slots” worldwide premiere! World’s First Mix of Casino Slots and Dating Simulation Game! “Win His Heart Slots” worldwide premiere! NTT Solmare Corporation (Headquarters: Osaka, Japan; President: Akira Tomana, hereafter referred as “NTT Solmare”) and Sammy Networks Co., Ltd. (Headquarters: Tokyo, Japan; President: Takayuki Kawagoe, hereafter referred as “Sammy Networks”) has released world’s first romantic casino game “Win His Heart Slots” for both iOS and Android devices. Based on the data provided by Google Play and App Store, the mobile casino gaming market in US generated a revenue of about US$1.6 billion in 2017. Given both the stable growth in the market and the popularity of such games among women customers, NTT Solmare collaborate with Sammy Networks, a leading provider of Japanese pachinko and slot games, to release “Win His Heart Slots”, the unique mix of casino slots and dating simulation game worldwide*. This collaboration is a first step on the way to becoming a global provider of mobile casino games. Enjoy the free spins, bonus games, hit the jackpots and many more! Each slot machine features a handsome anime character from social-based dating simulation game series “Shall we date?” released by NTT Solmare. The higher your level is, the more characters and machine choice you have. Play the game, raise your level and enjoy numerous love affairs! In “Win His Heart Slots”, you will be able to enjoy some gorgeous visual effects characteristic of Japanese slot machines, which are unprecedented in any video slot game. 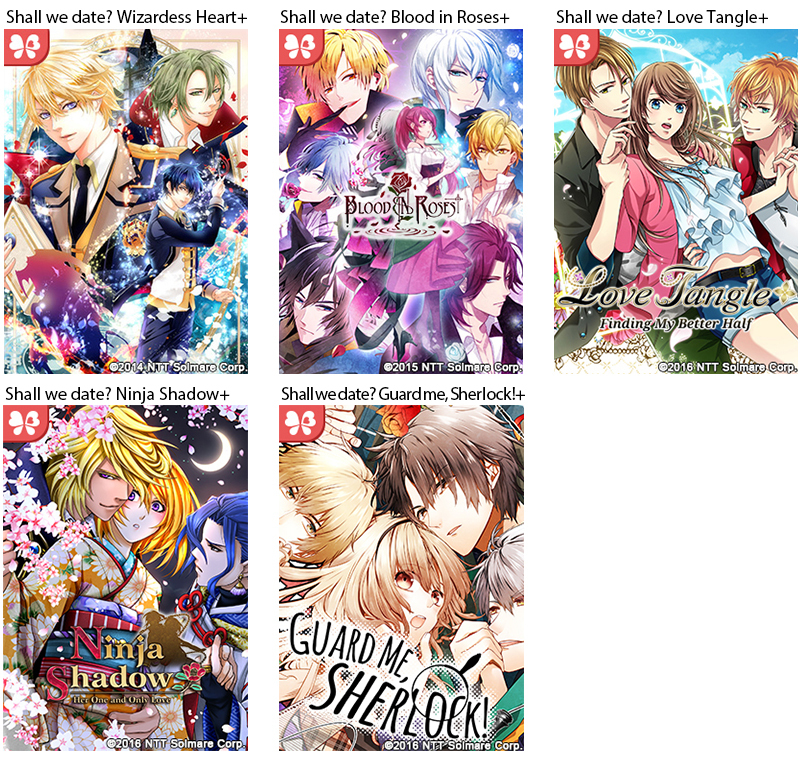 Game apps which NTT Solmare has released under the brand name of “Shall we date?” is US favorite dating-simulation series that also have been enjoyed in 166 countries, with more than 32 million downloads from all over the world. “Shall we date?” games have received praise from their fans, having an average review score of 4.4/5.0 in iTunes App Store as of April 2018. 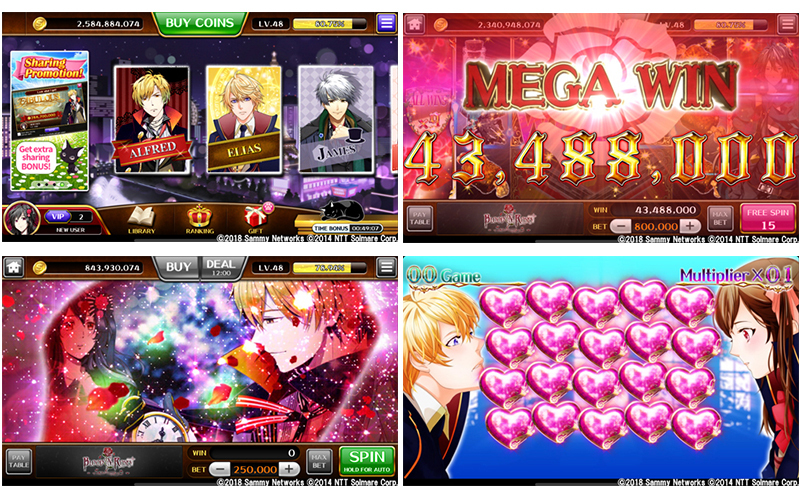 “Win His Heart Slots” features the anime characters from five the most popular titles of the series for users to enjoy. The subsequent updates will provide themes and characters from other games. *The game is NOT available for customers residing in Japan, China and EU countries. •Released by：Sammy Networks Corp., Ltd.
5． Sammy Networks Co., Ltd.
Sammy Networks, as a member of SEGA SAMMY Group, provides Japanese pachinko and slot games for personal computers (777TOWN.net) and mobile devices (777TOWN for Android, 777NEXT). Copyright (c) 2019 NTT Solmare Corporation. All rights reserved.